hi to all, just a little bit of info on my seats. The small pans from West Eagle measure 13inches long by 9.5 inches wide and the large measure 14inches long by 13.5inches wide. 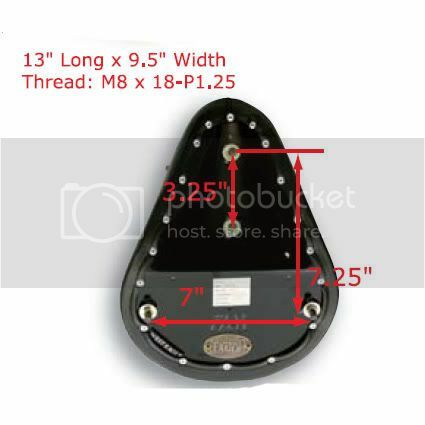 The photos below show the placement and measurements of the mountings. The seats cost $300 ($270 for forum members) for the small with no carving and $400 ($360 for members) for the large with no carving, and with carving add $50 ($45 for members). If you supply your own pan, take off $80!!! If i have the pan size in stock that you want , the completion time is about 2 weeks (sometimes less! 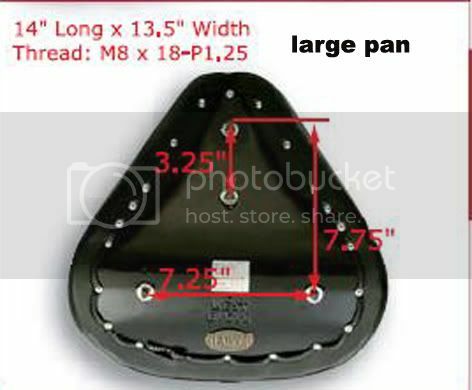 ), if i have to order the pan from West Eagle in the USA, please allow about 3 weeks for completion. All orders require $100 deposit. Last edited by leatheroo on Sat Jun 19, 2010 1:36 pm, edited 1 time in total. Only $50 extra for the carving!?!?! Sounds too good to be true! El Skitzo wrote: Only $50 extra for the carving!?!?! Sounds too good to be true! yes, only $50 for carving. Most carvings dont take that long to do....the lacing takes WAY longer!! I have a day job, so i am not trying to make a living from the seats...i enjoy making them and carving them.